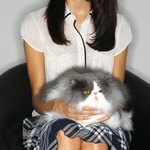 Why Does My Cat Keep Sneezing? Cats sneeze for the same reasons a human sneezes. Sneezing is an reflex reaction caused by an irritation to the nasal passage. It can have many causes, both serious and non-serious. A diagnosis from a veterinarian is always the safest course of action. Anytime your cat's behavior suddenly changes, seek medical advice. The most common cause for a cat to sneeze is from an upper respiratory infection, either of viral or bacterial origin. Your cat may even have a fungal infection. And, though it is not common, some cats develop allergies that may cause sneezing. Other causes include having a foreign object lodged in the sinuses, such as a grass seed. Your cat may be sneezing in response to irritants such as smoke or perfume. A dental abscess, nasal polyps and nasal cancer are more serious causes. Have a veterinarian perform a physical examination for an accurate diagnosis. However, things you can and should note to help your veterinarian gather a complete story include noting if your cat has any discharge when sneezing. Note the appearance of discharge, its thickness and coloring. If your cat has other symptoms, such as a discharge from his eyes or sores in his mouth, he has likely caught an infection. The veterinarian will check your cat's temperature for a fever. Note if the cat shakes his head a lot or paws at his nose as if something were inside. If the cat acts as though he's itching, perhaps by rubbing his face excessively, it may be allergies. Likewise, if the sneezing seems to occur at the same time of the year from year to year, it's likely to be seasonal allergies. If obvious symptoms don't present themselves, your veterinarian may run a battery of tests to determine the cause. Treatment depends on the cause. For the common infection, an antibacterial medication will likely be prescribed. Your veterinarian may even start the process with a shot, then give you tablets to administer to your cat. If your cat has a fungal infection, an antifungal treatment will be used. For a dental abscess, the tooth may have to be removed. Surgery can remove polyps, and cancer would be handled with traditional cancer treatments. If you cat has caught a flu (viral infection), all that can be done is comfort care while the cat recovers. This may include giving the cat fluids and possibly force feeding him. As well, clearing his sinuses of mucus will help him breathe. Vaccinations against "cat flu" is the best way to avoid a viral infection. Check with your veterinarian to see if this is recommended for your cat.